Coloring Book for Naruto and Friends version : Tap & Color is an interactive coloring book designed for toddlers, preschoolers, and young children, including those with special needs and autism. Even young toddlers will learn how to use this coloring book without a parental assistance. - Save your child's creation to your device. To play this game, you just need to select what picture do you want to paint. Then you can choose the color you like and touch the screen to change the color. 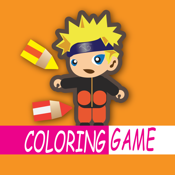 Let's enjoy naruto uzumaki and friends coloring free game.